We are less than a week from Thanksgiving and at our house it is all about turkeys this year. After reading a dozen books from the library and at school about turkeys, the kids are excited to celebrate Thanksgiving with our families. We spent a lot of time this month talking about the things, and people that we are thankful for and really try to help the kids see this holiday as a chance to give thanks for what they have. 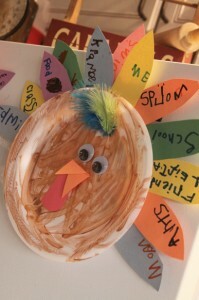 Here is a cute turkey craft that does just that. A paper plate and construction paper transform into a cute way to display what the kids are thankful for. Last year we had great success with our thankful tree and had so many great conversations with our kids about being grateful. This year we took more of a kid friendly approach and decided to do a cute little craft and work in the conversation about being thankful as we created something to decorate our home. 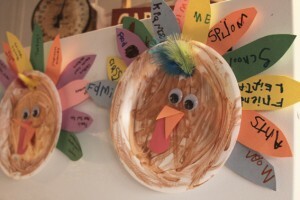 These paired great with our toilet paper roll turkey craft and were a big hit! These little turkeys took just a few minutes to create but left us with a lot of great things to talk about! We began by painting a plain old paper plate brown. We then glued eyes and a beak to the plate and created a bunch of feathers from construction paper. You can either draw them out and let the kids cut, or let them draw their own. We then sat down together while our paint was drying on the plate to have a talk about what we were most grateful for. The kids were instructed to think up one thing they were blessed and happy to have in their lives, and then add it to a turkey feather. My daughter took a while to come up with all of hers, but after a while I was able to fill in all of her feathers for her. My 5 year old on the other hand went straight to work and had finished tail feathers in no time. By far my favorite part of this project was seeing him right all of the words all by himself. 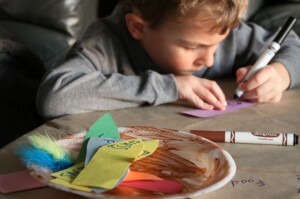 Each word was carefully written and thought out as he wrote down letter by letter what he was thankful for. I am so proud of how well he is doing on his reading and writing and I love looking at his turkey hanging on the fridge with his handwriting on it while he is off at school during the day. Nothing is more special than seeing him write “mom” in his own handwriting on a thankful turkey. Oh be still my heart – these are the moments I will cherish forever and ever. Of course when they asked me what I was most thankful for I answered that they were my greatest blessings – which created a sweet little smirk on both of their faces. 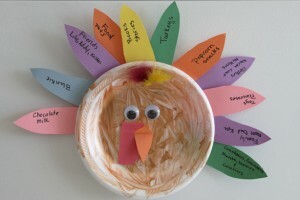 This is a great project to do with the kids this week as you prepare for Thanksgiving! Get them talking about the things that really matter to them and to you – you would be surprised how amazing the conversation will be no matter what age they are! 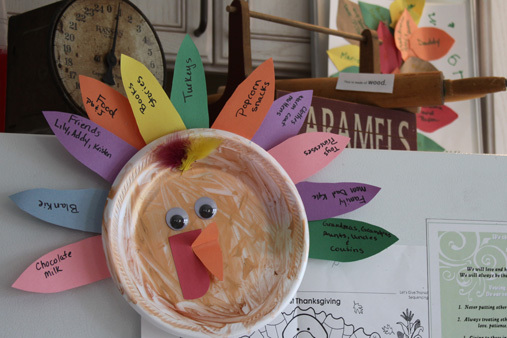 I added magnets to the back of their turkeys so that we could hang them on our refrigerator as the perfect thanksgiving decoration – thoughtfully made by the kids.